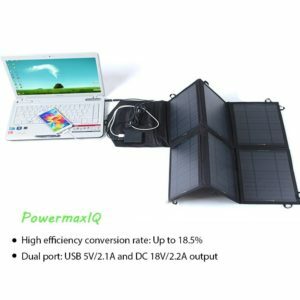 Here is one that might just feature the widest range of compatibility of any other of our best portable solar panels we have reviewed. The Sunkingdom solar charger is definitely one that caught our eye. It holds a 3.9 star rating on Amazon and many positive reviews. Let's start digging into this guy. The Sunkingdom solar charger a big one, but it can fold into a very convenient carrier. It measures at 31.8 x 0.1 x 20.1 inches and weighs just over 3 pounds, 3.24 to be exact. So yeah it is pretty big. When it is folded, it can easily be fit inside a backpack, but it will take up a good amount of space. So if you take it out on a hiking trip, best to just strap it to your backpack and let it soak in the rays. 39 watts. Big design also gives huge power. It also includes Sunkingdom's exclusive PowermaxIQ technology, which delivers the fastest and most reliable charge possible to your devices. While it does have two ports, only one is a USB 5V/2.1A port. But the other port makes the charging possibilities much wider. The second port is a DC 18V/2.2A, which can support many laptops, portable gaming consoles, cameras, and many other devices. This is why we claimed the Sunkingdom solar charger as the widest compatibility we have seen yet. It can even charge a 12V battery, by using a solar controller. But of course, you would have to buy that separately. This solar charger features 6, count them, 6 monocrystalline solar cells. Each of those solar cells has an 18.5% conversion rate. While others we have seen have been a bit higher, none have features this many solar cells on one device yet. The outer body is follows the same quality trend as the rest of the device. It is made from waterproof PVC fabric which makes it very durable as well as protects it from the elements. An anti-scratch plastic coating covers the solar cells, in the event that the device falls or has dirt thrown against it. All of it is very protective, so you will not have to worry about any damage coming to your device. However, there is no protective cover for the charging ports. So just be mindful about those. There is also a canvas pouch that is great for protecting your small devices while they charge or for carrying any extra cables or plugs. In addition, there are canvas loops above each of the solar panels. So if you want to attach it to a backpack, on top of a tent, hang on a tree even, you are good to go. With 8 loops, there are many possibilities. One of the best things about this solar charger is the wide compatibility. With the 39w solar charger, you also get 10 DC connectors. These connectors are compatible with a wide range of devices including laptops and digital cameras. Whatever you or your friends need to charge, odds are you will find one of these connectors to fit the device. Taken directly from the company page on Amazon. "SUNKINGDOM STORE is major in offering quality solar panel products which are convenient for people to be taken in outdoor activities. Such as hiking, travel. SUNKINGDOM strives to provide the most economic and environmental friendly clean energy readily accessible to its customers." While no website was found for this company, a facebook page was available. However, the page has not been in use since July of 2016, with only two posts being made during that time. Nevertheless, the company has a 92% approval rating on Amazon. In fact, only 5% of reviews have been negative in the last 12 months. Even though their products have not achieved any best seller status, people seem to enjoy their purchases. Say it with me. 39 watts. That is a lot of power for a portable solar charger. It can easily and quickly charge any of your devices. While it only has one USB charging port, the second port is a DC 18V port, which we have not seen before on a solar charger. The ability to charge larger devices like laptop computers with the power of the sun is pretty awesome. The PVC fabric keeps the solar panels and circuitry well protected from the elements. 6 monocrystalline solar cells. Monocrystalline are by far the most efficient type of solar cell available, however they are expensive. A wide range of charging possibilities. While 10 DC connectors may sound like overkill, it definitely keeps you well prepared. 8 fabric loops on each end of the solar charger make for easy attaching to basically any surface. Though you will probably want one that faces the sun most. It is really big. You may not want to take this thing backpacking or hiking because it will take up a good amount of room and add significant weight to your pack. Surprisingly low conversion rate when compared to others of even a smaller size. Though 18.5% is still very good. The charging ports are vulnerable to the elements. Be mindful. If you are looking for something to take on a weekend trip where you won't have access to electricity, this is the solar charger for you. While it is big, bulky and heavier than others we have reviewed, it is super powerful and efficient. It can charge your laptop so you can still use that while you are out camping, but it can also charge your digital camera, smartphone, and essentially any other device, even your car's 12v battery if you have the proper additions. It is expensive, but you are getting a lot with this purchase. It is not a power bank, but it can charge one very quickly. This is a quality solar charger. The Sunkingdom Solar Charger, while expensive, gives you a lot of power and reliability. Speaking about expensive, it is $89.99 right now on Amazon. If you are looking to drop some cash for a great product that will supply you with some crazy power, look no further. Here are some top questions that I found for people seriously considering buying the Sunkingdom Solar Charger. Is it waterproof? The panels are waterproof, thanks to the PVC fabric. However, there is nothing covering the charging ports, so they will not be waterproof. It should be fine in rain. Will this auto-restart after interference from clouds or other shade? Yes, as soon as it hits sunlight, it will begin to generate energy. Will it charge anything requiring higher than 18V? As long as you leave it out in the sun, it will charge anything. Just probably at a much slower rate.